and so i rise...: Born to Ride! 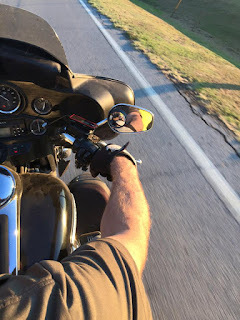 This was my view from the back of the Harley I rode all last week in the evenings when all the work was done each day. I actually love this view. There's the world to look at and admire. Then there are those arms and hands. They are powerful and strong. I'm never afraid riding this Harley with this man. He's cautious and confident. He would never take a risk that would result in me being hurt. He's wonderfully trustworthy. He also thinks I'm eye candy on the back of his bike. Can't beat that. Well except when you drive the bike yourself. One year from now, I will.